Old Style Appliances Making a Comeback? Retro appliances are the next NEW thing. GE makes a statement with a “nod to the past”. Retro looking appliances have been around for a few years. Specialty brands that you may not be familiar with offer a variety of looks in an array of retro colors including pink and turquoise. Elmira Stoveworks even turns the dial on the way back machine waaaay back and adds wood burning stoves to their appliance selection. 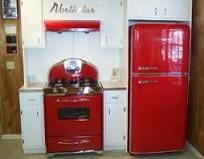 Elmira also manufactures Northstar, a line of kitchen appliances with a 50's look. Other manufacturers of retro appliances include Heartland and Big Chill. Feel free to chime in if I've missed anybody. A more recent offering comes from SMEG, an Italian brand that manufactures a retro style refrigerator in a variety of colors. 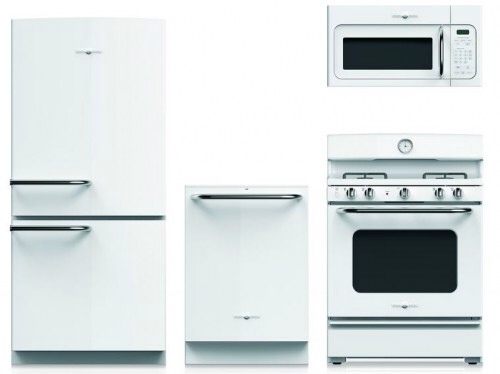 GE just announced a new line of appliances called the Artistry Series designed for Millennials and designed by a Millennial, 27-year-old GE industrial designer Tomas DeLuna. While the affordable line is targeted to the young, it definitely takes you back to yesteryear. DeLuna doesn't use the term “retro”. Instead he says, “The design is authentic and contemporary with a nod to the past”. Available in shiny black or white, the series features an analog clock on the range, chrome accents, and the old GE badge with the words General and Electric spelled out. What's next? Maybe GE will bring back their old monitor top refrigerator. This entry was posted in Appliances and tagged appliances, Big Chill, Elmira Stoveworks, GE, General Electric, Heartland, Northstar, SMEG. Bookmark the permalink.